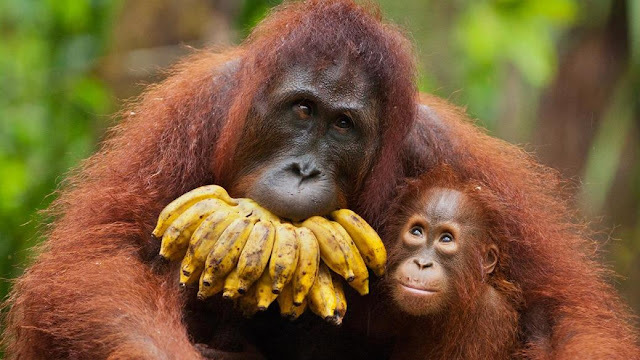 Do you know that one species affected by palm oil production is the orangutan population. In some regions, oil palm cultivation has resulted in deforestation, leaving species that lived in virgin forest without a home. Some palm plantations have been developed without consulting local communities over the use of their land, or even caused them to be forcibly displaced. The orangutans are three extant species of great apes native to Indonesia and Malaysia. Orangutans are currently only found in the rainforests of Borneo and Sumatra. Palm oil is an edible vegetable oil derived from the mesocarp (reddish pulp) of the fruit of the oil palms, primarily the African oil palm Elaeis guineensis, and to a lesser extent from the American oil palm Elaeis oleifera and the maripa palm Attalea maripa. Palm oil is naturally reddish in color because of a high beta-carotene content. Along with coconut oil, palm oil is one of the few highly saturated vegetable fats and is semisolid at room temperature. Palm oil is a common cooking ingredient in the tropical belt of Africa, Southeast Asia and parts of Brazil. In India, we have a different one – the ‘palmolein’. The fad for this oil was so high a couple of decades ago, that the Govt. was importing them in bulk tankers and redistributing to households, who were using this oil moving away from dalda vanaspathi, groundnut oil, gingelly oil, bran oil and other cooking oils. Now refined oils like sunflower, olive, safflower, avocado have all taken over. There were concerns that at any point time, the palmolein available in the market far exceed the quantity of oil that had been importing, hinting that there was heavy adulteration in this brand. Palm oil and palm olein originate from the same plant, a palm species known as E. Guineesis. Palmolein has different characteristics than the palm oil, most notably that it remains completely liquid at room temperature. It is highly heat resistant, similar to palm oil, and it also resists the formation of breakdown products during frying and increases the shelf life of many products. The Palm Olein Import Scam refers to the alleged irregularities in the import of palmolein by the K. Karunakaran-led United Democratic Front government of the state of Kerala, through the Power and Energy Limited Company. The Kerala government selected Power and Energy Limited arbitrarily without inviting tenders, allegedly at an inflated price and at an excessive service charge and in violation of central and state government procedure and this scam was first brought to light officially by a report of the Accountant-General of Kerala in July 1993, a Comptroller and Auditor General report in February 1994, and subsequently by a report of the Public Undertakings Committee of the Kerala Legislative Assembly in March 1996. Although palm oil and palm olein are produced from the same plant and share many similar properties, the main difference between them is their chemical state at room temperature. Lliquid palmolein is considered the "gold standard" and is the most widely used oil for frying in the world. Now comes the news that Palm oil is to be removed from all own-label food sold by Iceland amid concerns over its impact on wildlife. The oil is used in a huge number of products on supermarket shelves ranging from bread to soap. In some advanced countries, the demand against palm oil has come as it is voice against the destruction of tropical rainforests across south-east Asia, which threatens the existence of endangered orangutan in Indonesia. The Deeside-based chain - the first major UK supermarket to ban palm oil - said it was used in more than half of its products, from biscuits to soap. Iceland said growing demand for the oil was devastating tropical rainforests across southeast Asia. The frozen food specialist said it was alerted to the environmental challenges that palm oil presented by campaigners at Greenpeace. The ban only applies to Iceland-brand products, meaning other products sold by the retailer may still contain palm oil. Iceland managing director is quoted as saying that there was "no such thing" as properly sustainable palm oil. Millions of acres of forests across Indonesia have been burned to make way for plantations producing palm oil. Orangutan populations have been particularly devastated by the resulting habitat destruction. Iceland has now vowed to remove all palm oil from its own-brand food by the end of 2018.